(Photo credit: Sumio Yamada) By Jim Dower: In a one-sided fight, unbeaten 32-year-old World Boxing Council bantamweight champion Shinsuke Yamanaka (22-0-2, 16 KOs) stayed undefeated with a 12 round unanimous decision win over #1 WBC Suriyan Sor Rungvisai (37-6-1, 16 KOs) of Thailand on Wednesday night at the Yoyogi #2 Gymnasium, Tokyo, Japan. The southpaw Yamanaka knocked Rungvisai down three times in the fight in dropping him in the 7th, 8th and 9th rounds with hard left hands. In the 9th, Rungvisai was docked a point for attempting to throw Yamanaka to the canvas. The final judges’ scores were 114-110, 116-108 and 115-109. Yamanaka knocked Rungvisai down with straight left hands in the 7th and 8th rounds. 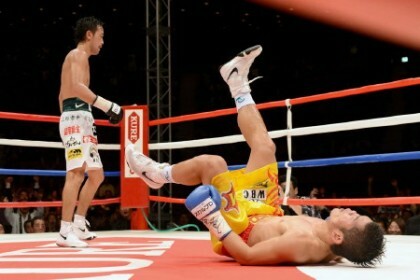 In the 9th, Yamanaka flattened Rungvisai with a left uppercut to the head. Rungvisai came out on fire in the 12th round trying to score a knockout, but Yamanaka did a good job of tying him up to prevent him from landing anything big. Rungvisai still was able to land some big shots in the round, especially to the back of Yamanaka’s head. In other action on the card, Takahiro Ao (27-2-1, 12 KOs) decisioned Juan Carlos Salgado (26-4-1-1NC, 16 KOs) by a 10 round unanimous decision. The final judges’ scores were 97-94, 97-93, and 98-92. Ao did a great job of landing combinations. He had Salgado hurt in the last round of the fight.